The technical specifications, testing equipment and coding schemes that make industry lightfastness tests look difficult shouldn't scare you from doing tests of your own. Testing paints requires no more skill than making a small painting and framing it; all the materials you need are available by mail order and at your local hardware and art stores. The sun provides your testing lamp, and your eye decides when there is a significant change in paint appearance. I realize that it's convenient and reassuring to take paint lightfastness on faith, or on someone else's advice, but once you see your own paints change and fade in a way that simply does not jibe with the ratings published by paint manufacturers or consumer guides, you will never again bother to consult any other source (including this site). You will do your own tests. (8) let sit undisturbed for four months between May and October. When four months have passed, remove the samples from the frame and look for shadows of the aluminum tape mask across the paint samples. Any paint showing a tape shadow is unsuitable for artistic use. This quick and dirty test is sufficient to reveal any problems in your customary materials, and is easy and informative enough to do at least once to ensure the quality of your chosen watercolor brands. You can go about the tests with more rigor, and the procedures are explained below for reference and, dare I hope, actual use. However, the quick and dirty test is sufficient for the basic purpose  identifying paints that fade. Do not pretend that testing your paints is something too complicated for you to do. This section presents complete instructions for lightfastness testing using the method that I believe gives the best overall results for watercolor paints. My method is not exactly the standard (industry accepted) tests described by the American Society for Testing and Materials International, so I present my method in contrast to the ASTM recommended tests and my concerns with them. Before we get to that, I need to explain two important issues, measuring light exposure and preparing paint samples. Finally we get to a list of the required materials for the test and my recommended procedures for conducting lightfastness tests. Measuring Light Exposure. Because sunlight intensity changes dramatically across the spring and fall equinoxes, and clear weather, longer days and more vertical sunlight produce quicker test results, the most effective test interval is between April 15 to September 15. But how do you determine the accumulated energy of light exposure? The first method is to use a sample of alizarin crimson, exposed to light in the same way as the other paints you test (as described below). An obsolete 19th century pigment, alizarin crimson is too impermanent for artistic use, but it does make a useful exposure meter when painted out as a sample paint swatch. OK, but at what dilution? For reasons explained below, I suggest a 1:12 or dilute concentration  about 1/4 teaspoon paint dissolved 1 tablespoon water, brushed out with a saturated 1" acrylic flat brush to produce a homogenous color. When this swatch begins to fade, you have reached approximately one half the light exposure that any artist's grade pigment should withstand without visible color change. During the months of April to September in most USA locations, with clear weather, this will happen in four to six weeks. Then expose your test samples for twice the number of days it takes the alizarin crimson tint to fail. If the alizarin begins to fade after six weeks, expose the rest of your samples for 12 weeks. Don't count foggy or heavily overcast days; light overcast or partly cloudy days should be included. Paints that remain unchanged after this period are minimally adequate as art materials. To be really confident in your materials, they should remain unchanged for four times the alizarin standard  that is, four to six months of daily sunlight exposure. The other and better solution is to purchase a blue wool scale designed to measure light exposure. This is especially handy for testing year round, testing across extended periods of variable weather, and testing cumulative indoor light levels (for example, the impact of gallery lighting on art displays). The brilliant blue reference strip is the most fugitive (level 1), the dull, dark reference strip the most permanent (level 8). Golden Paints no longer makes their very handy Lightfastness Test System, but you can still purchase individual blue scales (textile fading cards) from TALAS in New York. The blue scales cost about US$10 each, less in quantities of 10 or more. For instructions on how to perform the blue wool tests, you can buy a reprint of the ASTM's Standard Practice for the Visual Determination of the Lightfastness of Art Materials By the User (D5398-97) for US$25, if you can't find the encyclopedic ASTM standards volumes in your local city or university library. Or you can use the excellent lightfastness test instructions in Mark Gottsegen's painting handbook (pp. 128-31). "A significant change" means an unmistakable, definite discoloration: it must be clearly visible when viewed through a 5mm x 40mm (3/16" x 1-5/8") rectangular window cut in a piece of medium gray card or construction paper. Buy a sheet of medium gray construction paper or art board and make one of these cards for yourself; you will need it for the tests described later. This window equalizes the visible area of the blue wool scale and paint samples, and reduces the area enough to hide the slight dulling of color that usually occurs before the sample actually fades. Finally, the samples must be viewed under bright indirect (indoor) daylight or under an artificial light source of color temperature between 5000K to 7500K and a CRI of 89 or higher. This essentially means samples must be viewed under four 150 watt tungsten halogen bulbs or a photographer's incandescent flood lamp, or a 200 watt metal halide bulb of 5400K or higher. It explicitly excludes all fluorescent, sodium and mercury lights: these will make some color changes very difficult to see. Preparing Paint Samples. Lightfastness results are greatly affected by the density or thickness of the test sample, the fillers or extenders added to the pigment in the paint, and the paint vehicle. You've already determined the vehicle and the amount of fillers or extenders in the paint by your choice of watercolor paint brands. So the only issue is the required concentration or dilution of the paint used to prepare the test samples. Here I disagree with the ASTM standards, which stipulate (ASTM D5607-99, p.3) a liquid draw down sample over Whatman white filter paper, at a dilution that produces approximately a 40% reflectance in the most absorbing (darkest) part of the paint's reflectance curve. That is, the point of minimum reflectance in the reflectance curve must be about 40%; all other parts of the curve will have an equal or higher reflectance. This gives a homogeneous color at a specific paint density, but in most paints the result is a fairly thin color appearance. How thin? Well, a lamp black paint has a roughly flat reflectance profile at around 5%, so a minimum reflectance of 40% means a total reflectance of 40% across the entire spectrum, which in the reflectance to lightness curve equals a CIELAB lightness of about L* = 69 (a Munsell value step 7), which is a light gray. We can translate this lightness into an approximate dilution recipe if we consider the paint's value range, which is provided for all watercolor paints in the guide to watercolor pigments. The value range of a black watercolor is around 75, and a lightness of 69 defines a value range of 28, which is roughly 40% of the masstone value range for black. Since black is the darkest paint, we can conclude that every other paint prepared to the same specification must have a lighter value than L* = 70. Inspection of pigment reflectance curves (linked from the spectrum icon in the notes to major pigments in the guide to watercolor pigments) indicates that nearly all paints have a minimum reflectance of 15% or less at some point in the curve. So we can apply the 40% ratio to the value range of a paint to determine the dilution of that paint necessary for a lightfastness sample. However, we are really only interested to prepare an accurate exposure sample of alizarin crimson (PR83). So we first look up its value range across all the watercolor paints tested, which is about 55. Then the light exposure samples described above must have a value range of 22 (that is, 40% of 55), or a CIELAB lightness of about 76. The samples below show these value differences; print the image to compare with the lightness of your own paints. Most watercolor painters will have the immediate reaction that these are strongly diluted paints. 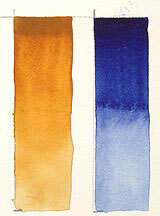 And while watercolors are used in diluted concentrations, they are also commonly used at nearly full strength. The ASTM standard is not representative of common painting practice. The wisdom of experience is that diluted paints are less lightfast than concentrated paints, so measuring the diluted paint is a more rigorous or conservative test of paint permanence. But this is not always true. Some pigments are prone to darken in moderate to thick concentrations and are actually more durable in dilute applications. As I've documented for several common pigments (PBr7, PR101, PR108, PY35, PY42 and PY184), discolorations appear in concentrated samples of paints that appear "totally lightfast" as diluted layers in my own tests. So the better way must be to test paints in both concentrated and diluted samples. Surprises do happen! Here is how to get the necessary paint variation. Charge a flat acrylic brush in the paint mixture, wick it gently against the side of the paint well, and paint half the length of the test swatch with a single, even stroke of the brush. Partly rinse the brush, shake out excess liquid, then continue the stroke to the full 3" length, using only the water remaining in the brush. The first brushstroke with concentrated paint should vary from a wet masstone to a thinning, nearly dry middle color, while the second stroke with the moist, rinsed brush should dilute the end of the stroke into a tint as light valued as the diluted samples shown above. If this is too difficult, try painting the top third of the swatch in the masstone mixture, then pull the stroke down the rest of the way with a brush moderately charged with clear water. An alternative procedure is the draw down sample. With a brush, prewet the lower half of the swatch area with clear water to a moist to satin wetness, then place a small bead of paint on the paper at the top of the swatch area. Set the edge of a putty knife or large palette knife on the paper just above the bead, hold the blade at a 60° angle to the paper, and press into the paper until the blade is slightly flexed. Then pull the knife sharply down and across the paint bead to the bottom of the swatch area. This smears the paint across the paper in an even, thin coat: the prewetted area should hold more paint to give a darker color. The drawdown method is not good for testing the complete range of paint dilutions, but it is very quick and easy to do, and extremely consistent once you get the hang of it. ASTM Recommended Tests. Once you've prepared paint samples and have a blue wool scale, you can do an ASTM standard test. Both tests require a viewing card to control visual examination of the paint samples, and samples mounted or framed under glass and light protective strips of aluminum tape, as described for the quick & dirty lightfastness test. 1. Expose the paint samples continuously, and examine every few days, until the blue wool reference 3, when inspected through a small window in a medium gray viewing card, first shows a visible contrast between the exposed and masked sides of the reference dye. 2. Examine all paint samples through the viewing card, and mark any paint that shows a visible change as "fugitive." Evaluation: Paints judged to show no change are suitable for artistic work; paints in all other categories should not be used. Note: (1) These categories differ from those cited in the table blue wool/astm lightfastness standards. 1. Expose the samples continuously, and examine at regular intervals, until the blue wool reference 6, when inspected through the viewing window, first shows a visible contrast between the exposed and masked sides of the reference dye. 2. When a change appears in reference 6, examine all paint samples through the gray card, while viewing each of the blue wool references 1 to 6 through an identical rectangular window in a second gray card, until you can identify the reference band that shows the same or an equivalent amount of color change as the paint. Assign the paint sample this matching blue wool reference number (1 to 6). If the amount of contrast falls between two blue wool references, assign the paint sample a halfway score. If no change or a very slight change is visible, assign the samples a rating of "6+". 3. Ask two other judges to independently perform the same rating task for all samples. Average the three separate ratings to obtain a final rating. 4. Expose the samples further if desired until reference 7 changes. Reevaluate all samples that were previously given a rating of "6+": assign a "6" to any sample that has changed, and upgrade all unchanged samples to "7+". 5. Expose the samples further if desired until reference 8 changes. Reevaluate all samples given a rating of "7+"; assign a "7" to any sample that has changed, and upgrade all unchanged samples to "8". This is the end of the test. 6. Collapse the averaged ratings into five lightfastness categories, as follows(1): BWS 0 to 2.1 = "V, fugitive"; BWS 2.2 to 5.4 = "IV, inferior"; BWS 5.5 to 6.0 = "III, fair"; BWS 6.1 to 7.0 = "II, good"; BWS 7.1 to 8.0 = "I, superior". Notes: (1) These categories differ from those cited in the table blue wool/astm lightfastness standards. Judging the amount of contrast or change in two different colors is somewhat subjective. The ASTM attempts to address this problem by having three individuals with normal color vision separately make these judgments, then averaging their ratings to obtain the final result. I have less confidence in this approach, because it is in fact difficult to compare the amount of contrast in any light valued yellow or orange paint sample, or any color applied as a tint, with the contrast in the dark valued blue wool references, which are 70 units away from white on the CIELAB L* scale. Another problem is that paints change in different ways across time. There is variety in the color change itself. Most paints seem to fade and become duller in both masstone and tint, but there are many exceptions. Chinese white and convenience paints mixed with it will become whiter and more opaque. Impure synthetic inorganic paints, especially yellow cadmiums, will gray or blacken in masstone but change relatively little in tints. Aureolin grays in masstone and fades in tints. In paints that gray or darken, the color change is in the opposite direction from the blue wool scale. It is much easier to identify the time at which any change first occurs in the paint samples or reference scales. But there is also variety in the rate of change. Durable synthetic organic pigments, such as the quinacridones, pyrroles or dioxazines, will fade very slowly but steadily; others, such as alizarin crimson, will hold strong for a while and then rapidly collapse; still others, such as prussian blue, will show slight fading in the first few days, then remain completely unchanged thereafter. The ASTM method of evaluating visible contrast after a specific exposure time attempts to get around these complications, but consistent visual evaluation of color changes is still difficult to do. The method I used in the 2004 paint tests, and the method I suggest you use too, is to review the samples at regular intervals and note the number of days (weeks) of exposure at which each blue wool reference first begins to fade, as well as the time at which each paint sample begins to fade or darken. When the exposure has reached BWS 6 and higher, you (and two painting colleagues) can make the contrast matching judgments between paints and the blue wool reference strips. Using both time and contrast, you make a better judgment of color change in the paints. BWS 0-2.1 = "V, fugitive"
BWS 2.2-5.4 = "IV, inferior"
BWS 5.5-6.0 = "III, fair"
BWS 6.1-7.0 = "II, good"
BWS 7.1-8.0 = "I, superior"
I've omitted several details in the standard specification, including the preparation and mounting of paint samples, as discussed above. For complete information buy the ASTM document. Testing Materials. To prepare and mount the lightfastness samples, you'll need the following materials. The paint samples must first be mounted on a backing to keep them flat. For a small number of paint samples, commercial art store frames, the preassembled kind with a glass cover sheet, are ideal, if you can find one the right size for the number of paints you want to test, and if you can get one with a glass cover sheet is that is not UV protective. When in doubt, have a frame assembled to spec by a local frame shop, and ask them to use soda lime glass for the glazing sheet. 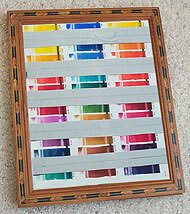 Or repurpose an unused frame from your studio. 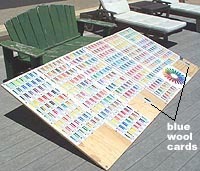 For a large number of paint samples, either on a very large test sheet or multiple sheets you wish to expose at the same time, it is more convenient to fasten the sheets to a sufficiently large rigid backing of plywood or thick composite board, and cover the board with a single large sheet of acrylic or glass. Again, the supplier should be able to cut the board and cover to your specifications, or even supply you with an appropriate scrap piece. The samples must also be covered with a glazing sheet to protect against dirt and moisture. If possible, use a cover sheet of 1/8" thick soda lime glass (which transmits nearly all UV radiation) from a local window and mirror shop, or a 3mm thick sheet of Acrylite OP-4 (an acrylic formulated to transmit 90% or more of UV light down to 300nm) from a local plastics supplier. Soda lime glass is the preferred cover sheet material, as it allows almost all UV light to pass and is completely rigid. If you must use a large sheet, then acrylic may be safer and easier to handle, though it becomes more opaque to UV light after a few months of exposure. Either way, ask your retailer or supplier to cut the sheet to match the dimensions of your mounting board. Glass is rigid and only needs to be secured around the edges of the backing board, for example by wrapping duct tape around each corner, which can be cut away to inspect the samples. The problem is getting the glass exactly aligned over the samples when you remove it to check the progress of the test. A frame does this reasonably well, but the sheet should be secured with duct tape at opposite corners of the backing, to prevent shifting in the frame. For larger sheets I have used the acrylic cover, as it can be secured with bolts through holes drilled through cover and backing, which ensures an exact alignment every time. 2. With your pencil and ruler, draw painting guidelines on the testing sheet(s), spaced to give yourself sufficient room between samples. The painted area should be 1" wide and about 3" long. (I draw lines to indicate the start and end of the swatch strokes down the sheet, and use the width of the 1" acrylic flat brush to keep a constant width down the page.) The samples should be spaced horizontally to keep them from running together; I prefer something around 1/4" to conserve space. 3. With a graphite pencil or indelible pen (such as a Sharpie), write the sample information at the top of each swatch area: the brand name of the paint ("Holbein"), the paint marketing name ("raw sienna"), and the pigment Color Index generic name(s) ("PBr7"). 4. Tape or clip the paper to a painting board if you are using a single sheet, then lay the paper flat on your work table. 5. On an easily washable palette or cookie sheet, squeeze out a small bead of each paint you want to test in a widely spaced line. If you are doing many paints, lay out about 4 to 8 beads at a time. Be sure you put the beads in exactly the same order as they are listed across the sheet! The size of the bead will depend on the highest concentration of paint mixture you want to test: usually, a daub about the size of a large pea or new pencil eraser is sufficient to get a swatch starting at a masstone or viscous concentration. 6. Use a 1/4 teaspoon measuring spoon to pour a constant quantity of water over each paint sample. (For most brands of paint, 1/4 teaspoon makes a mixture of roughly 1 part paint to 4 parts water, which is about right, but test this dilution on a few paints first to make sure you get the concentration you want.) Then dissolve the bead of paint in the water by brushing it gently around the palette. Make sure you completely dissolve any raw paint gummed into the bristles of the brush. 7. Paint the test swatches on the paper, using the method described above. Be sure you thoroughly rinse the brush between each color of paint. 8. If you have more paints to do, sponge or rinse the sheet clean, towel it dry, and lay down the next set of paint beads, in the order they are labeled on the test sheet. Repeat from step 6. 9. When you have finished all the swatches, set the sheet aside to dry thoroughly, and if needed continue to another sheet from Step 2. 10. Affix the finished test sheet(s) and exposure card to the backing. If you are using a frame, securely tape or staple the sheet(s) to the mounting board. If you are using plywood or other large backing, staple the sheets to the board with heavy duty (poster) staples. Affix the blue wool card or alizarin crimson sample in the same way. 11. Mount the cover sheet over the samples and use the ruler and a grease pencil or erasable pen to draw a line down the center of each row of swatches (that is, in the same direction as the brushstrokes) and down the center of the exposure sample or blue wool card. Remove the sheet, turn it over, and apply a strip of metallic tape to the cover sheet so that the two edges of the tape are aligned with two guide lines (shown at right). (Before peeling away the paper covering the adhesive, trim the width of the tape if necessary to get a close fit.) Apply the tape slowly, pressing firmly to prevent air bubbles or wrinkles. Do this between alternating pairs of guide lines until all swatches and the exposure sample or blue wool card are covered over half their width. 12. Turn the sheet over (taped side down) and place it over the samples. Check the fit of the tape mask over each sample. If you are using a frame, place the sheet and backing in the frame and secure from the back with removable wire brads or glazer's points so that the samples are pressed firmly against the cover sheet. Finally, wipe the sheet clean with a window or acrylic cleaner to remove the guide lines, fingerprints, dust, etc. 13. For indoor testing, set the test swatches in a south facing window that is not shaded during the day by trees, awnings, buildings or other obstructions. Do not place the samples in a kitchen, bathroom or other source of smoke or hot water vapor: this can cause some paints to dissolve or discolor. Do not set the samples behind a UV protective glass window: this will extend the time required to produce results. Nowadays many moderately priced to high end windows (including your car windows) are made with UV filtering glass to prevent sunbleaching of interior fabrics. Usually, but not always, a manufacturer logo stating this feature is embossed in a corner of the glass. If you are unsure, it may be better to expose the sample outdoors. Exposing samples outdoors will produce more aggressive tests, but requires that the samples be monitored carefully, and brought indoors each evening, to protect them against the effects of dew, rain or snow. The best location will be close to a door of your house. The sheets should be laid at an angle so that they are roughly perpendicular to the sun's rays. For most latitudes a 45° angle is a good compromise. 14. Check the swatches regularly, and less frequently as time goes by: once every 2 days for the first two weeks, then once a week for the next two months, then every two weeks until the test is completed. This will take longer if you expose the samples during periods of foggy, heavily overcast or rainy days, or during months of less intense light (October to March). To look for changes in the exposed paints, you must remove the cover sheet from the backing board (or the samples from the frame) and first examine the exposure sample or blue wool card, as described above. Make the inspection under bright north (indirect) daylight or ample incandescent light rather than fluorescent lights, as these will minimize visible changes in some colors. Hold the sample at a 45° angle to the light to eliminate glare. You must view the samples through a 5mm x 40mm (3/16" x 1-5/8") window cut into a large medium gray card or piece of construction paper to make contrast comparisons equal. (Changes you can see in the whole swatch, but not through the window, don't count.) Use the viewing window to examine each paint sample in turn, and look for a visible contrast between the masked and exposed side of the sample. If possible, expose the paints for at least four months, especially if you can just set them in a convenient window: you've already put a lot of work into making and framing the swatches, so there is no reason not to leave them exposed as long as possible. Anything unchanged after six months or longer is a genuine Hulk among pigments. For pigments rated in the guide to watercolor pigments as having "very good" or "excellent" lightfastness (blue wool scales 6-8), the major hazard to your art is probably not change in the pigments but deterioration of the paper you paint on. Make sure you buy the most stable and durable brands of watercolor paper you can afford  specifically, paper labeled 100% cotton, acid free or 100% cotton, pH neutral You can also test papers for lightfastness, too; newsprint, for example, will noticeably darken when exposed to sunlight for a single day. If you discover that a paper discolors during the tests, then switch to a better brand of paper for your work. With suitably prepared samples, these test procedures can also be used for colored pencils, colored papers, pastels and prints. If you have embarked on the process of selling your works as giclée prints (pronounced "zhee-klay"), the inks used in these prints should be tested too. Unfortunately I know of no published lightfastness tests of commercial inks used in giclée printers, so I highly recommend you test them on your own. The simplest and most accurate method is to sacrifice one of your own prints. Mount the print, or a section from it, in framing masked with parallel strips of the metal tape, along with a blue wool or alizarin crimson exposure card, and expose to sunlight as described above. When the test is completed, any light striping across the print indicates that the inks are not lightfast enough.